Seems like every time I visit a farmer’s market I become acquainted with something new. Todays post is not so much a recipe but rather a display or an exhibit of two very interesting finds. I brought these two items home more out of curiosity and I must say they are surprisingly good. Although not something you would find in your regular market, one of these two oddities grow rampant all over the world as a ordinary weed. Purslane. If you are really curious read this wiki article. You may have it growing in your yard! 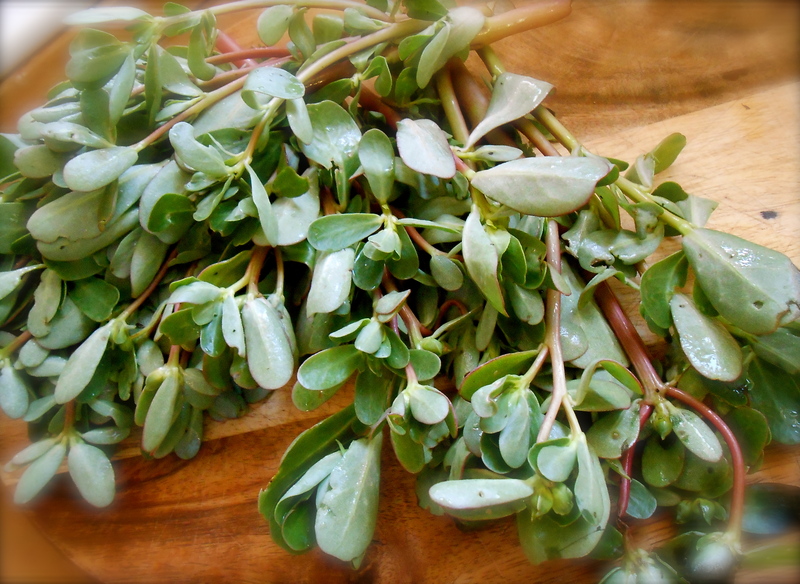 Purslane is one of the most nutritious greens on the planet. Evidently, purslane has more beta-carotene than spinach, as well as high levels of magnesium and potassium. Historically it has been used as a remedy for arthritis and inflammation by European cultures. A quick sauté of all ingredients in a large skillet. G r o u n d c h e r r i e s # @ ! ? These originated in South America. They grow in a husk just like tomatillos but are sweet and tart at the same time — the crunchiness of a tomato with the sweetness of a cherry. We ate these raw and are delicious added to a salad. Ground cherries taste like a combination of pineapple and vanilla. They are excellent for pies, jams and preserves. I had seen the ground cherries before but never knew their name. Fantastic. Thank you. I love purslane in salads. Ground cherries are good too! Thanks! Nice to hear someone knows what they are. I certainly didn’t, but glad to know because we really enjoyed them. Great texture eh? Yes, indeed! I had both for the first time in West Africa. Hi Seana! Ground cherries certainly are delicious. Purslane has completely escaped my knowledge . but now I know what it looks like! Hope you’re having a great week and that you’ll have an even better weekend! 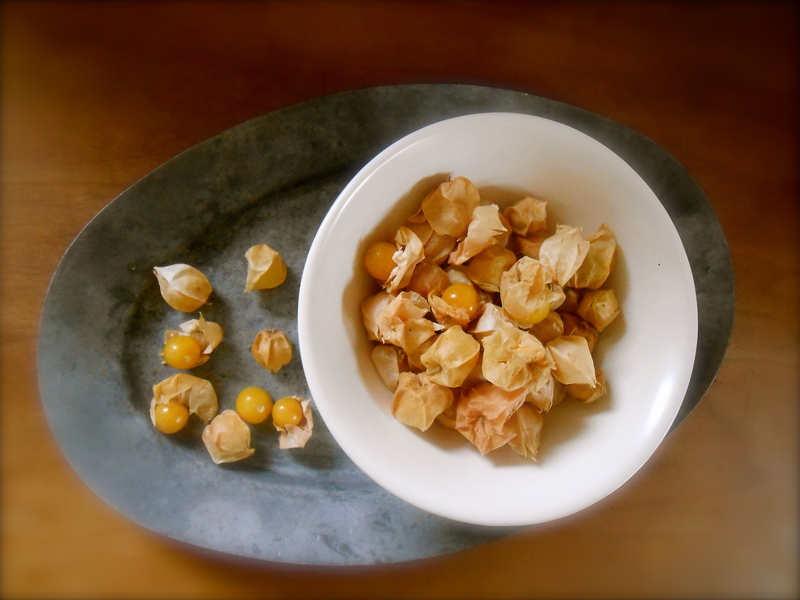 I’m still enjoying looking at my ground cherries in a bowl on the counter…wondering if they’ll really last months? I may have to save a few to test it out. Purslane I know, but ground cherries? That’s new – I will keep an eye out for them. oh those ground cherries are adorable. I don’t think I’ve ever seen any but would love to find some. Tart/sweet is the way to go! (tomatillos rock too) What a cool post! They really are interesting little delights! Look for them if you get to the farmer’s market. They reminded me of those little orange jack-o-lantern flowers but with a cherry-ish berry in the middle. Love tomatillos too! I just tasted ground cherries for the first time, they are delicious and never knew what purslane was, I have it in my backyard and pulled it thinking it was a weed. Geez, I’ve been discarding that good stuff all these years. Now I know. Great post!! Oh contraire, I have many many weeds. Purslane intermingled. I also have mosquitoes, I am waiting for the cold weather to get out there and do some work, I would be eaten alive, so I am embracing my weeds at the moment. Wow. Thanks for enlightening me. The market is such a learning experience every time i go. I never stop learning there. I admire your jumping right in. The salad looks delicious. Simple and clearly healthy! GREAT post! You’ve absolutely inspired me to try purslane. I’ve seen it for sale at my local farmer’s market, and have been curious for a very long time. There is a beautiful restaurant, Attica, around the corner from my house. The chef is known to forage in our local laneways for purslane. Great story about the chef from Attica! So innovative. Maybe you ought to get out there before he does and grab a bunch! :) We really enjoyed the thick texture of the purslane and even the stems softened up in the sauté. Hope you try them…please give me your thoughts if you do. For whatever reason Purslane rings a bell. Although, I don’t think I’ve ever tasted it. Anything with a lemony taste and I’m sure to like it. Isn’t it exciting being able to buy new ingredients. 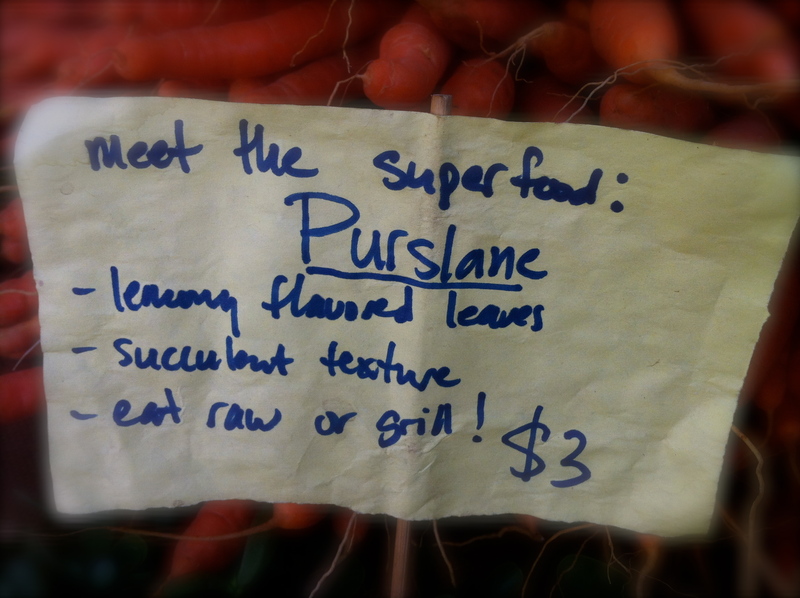 I’m so intrigued by purslane. It grows all over the world in many different climates (evidently it even thrives in a rock driveway!) Why we don’t see more of it in the markets is a mystery to me. My curiosity does get the better of me when I see something new at the market! They do! That is a perfect description of ground cherries. They certainly are an oddity. Thank you for the education. I have never noticed/seen purslane or ground cherries. What is lovely with this post is, not only you introduced them to us, but also how to use them, with photos feast to the eyes. We know ground cherries as physalis or Cape gooseberries. They seem to be used mostly for decoration, but I like their taste. Purslane, although I knew of the name, is completely new to me as an ingredient. Nice post. Oh yes, I have seen physalis as a floral type decoration. I’ve heard of them as “Chinese Lanterns” and they are a lovely vibrant orange hue. I read as a night shade varietal the husk from physalis are toxic! I love purslane a lot & my fzther grows it in his garden & each year it comes back on itw own in his garden! You are so right, it is very nutritious!!! I love your simple yet very tasty recipe too! Ground cherries are looking very interesting too! There is so much purslane in my yard. I will never go hungry. :) I’m not wild about it as a food, but I do like ground cherries! Is it the consistency you dislike? I’m curious. Yeah, I think it’s the succulent nature of the plant that I find a bit off-putting. Or it may just be residual hatred because of all the hours I’ve spent pulling the stuff up only to have it resprout an hour or so later! I have certainly eaten cape gooseberries on many occasions, as a snack. But I’ve also eaten cape gooseberry jam. It’s delicious. The purslane, I’ve never eaten as a salad, but I’ve tasted the raw one and it was on the sour side. Your local market is certainly very interesting and worth visiting. Thanks for sharing. Did it taste nice? Have a lovely Sunday!! I have to admit I am not very “adventurous” when it comes to eating unknown foods. I felt hesitant and apprehensive before taking the first bite. However, once I tried it I really liked it. The flavor of the onions, garlic, feta, olive oil and the natural lemony sourness of the purslane was as good as it gets. What really stood out was the texture of the purslane. It is a very thick leaved and stem plant, much like a jade plant. After cooking it became soft, not mushy and very pleasing. We liked it! I’ve seen both at the markets and have wondered about the ground cherries. I may pick some up and bake a pie. WIth those flavors, I bet the pie would be fantastic. Thanks for today’s lessons. Oh yes. I agree, a pie would be wonderful with ground cherries. I looked it up and there certainly are a good amount of recipes online. Such an interesting little berry. Fun post! Both of those are new to me. It sounds like I need to find a good farmers’ market. Thanks for including us in your shopping this week! 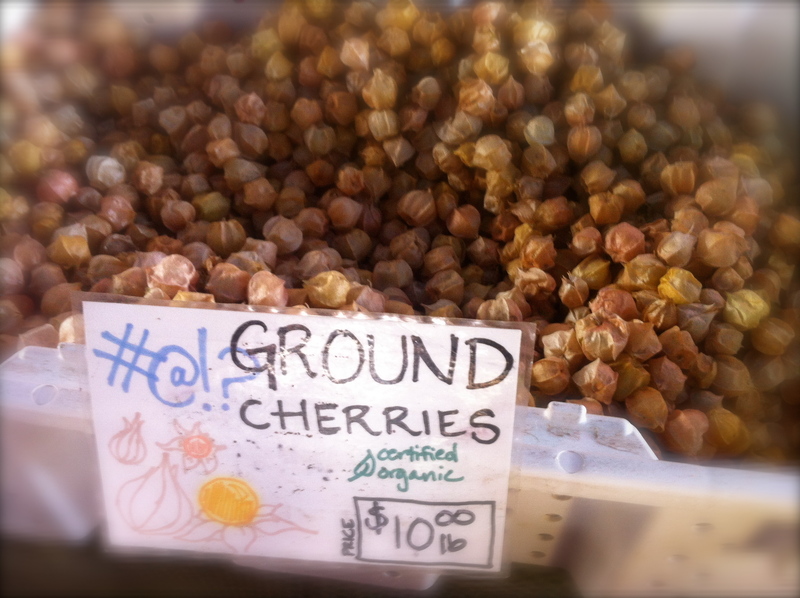 The ground cherries look like Physalis … I’ve never tried purslane. Interesting post ! Wow! Ground cherries sound really interesting! I am not at all familiar with purslane, but I do know ground cherries and i love them! 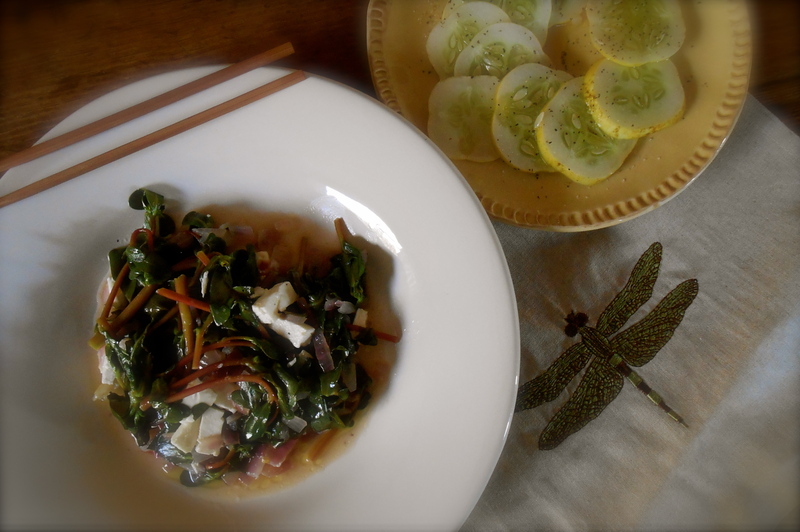 I love it – treating purslane like a wilted spinach with a feta accent. Love, love, love it to pieces! You are currently reading purslane and ground cherries at COTTAGE GROVE HOUSE.